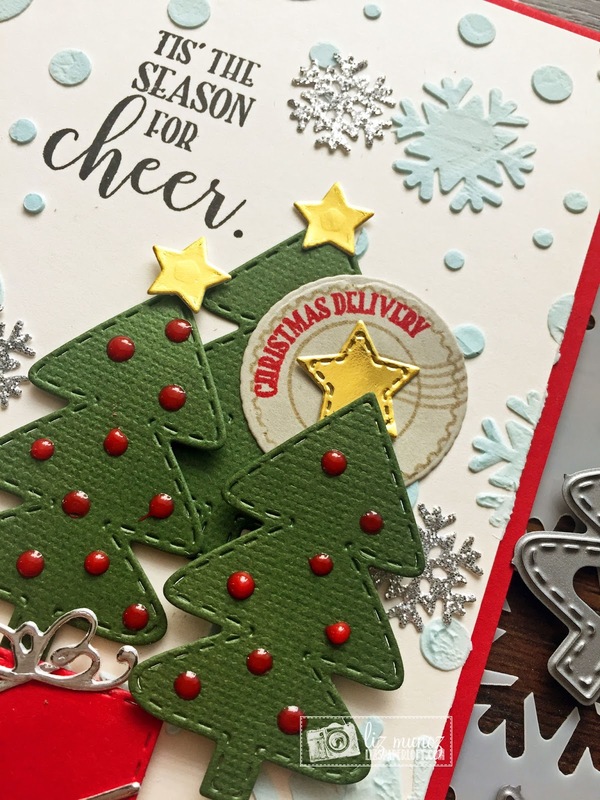 Liz's Paper Loft: MCT Flash Sale Blog Hop ~ christmas greetings! I used modeling paste with a drop or so of Tim Holtz reinker to tint it a pale blue with the darling stencil. Once it was dry I added the diecut pieces and stamped the sentiment. Man I love that Christmas Delivery seal, aside from the modeling paste it really makes it pop. WOWEEEEE......Your card is AMAZING!!!!! What a GREAT way to showcase this KIT to PERFECTION my friend!!! Thank you! Wow! What a pretty card! Love this adorable new kit! The color tinting of the texture paste is the perfect touch for those bigger snow flakes! Amazing demensions and laying with all the little dies! Simply beautiful card. I would put this in a little frame and display this along with other decorations! Or in a shadowbox! Love the new kit! 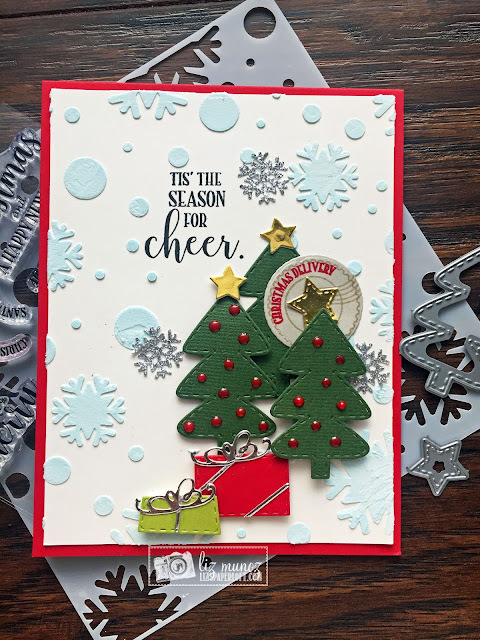 OMG Miss Liz What a Cutie and Beautiful Shabby/Chic Vintage looking card you created!! Love the collage of trees...looks so like an Old Fashioned Christmas...I love it so much!! You embossed background is so pretty!! You totally showcased today's new kit in a Spectacular way! YOU so ROCK!! What a neat background you created! Love all the layers and texture on your card! I love the texture and shine. The trees look great and I like the silver on the presents. Beautiful job. So clever and so creative!!!!! Darling card! Love the trees and presents! Great details! What an awesome card, Liz! I just love every bit of it! 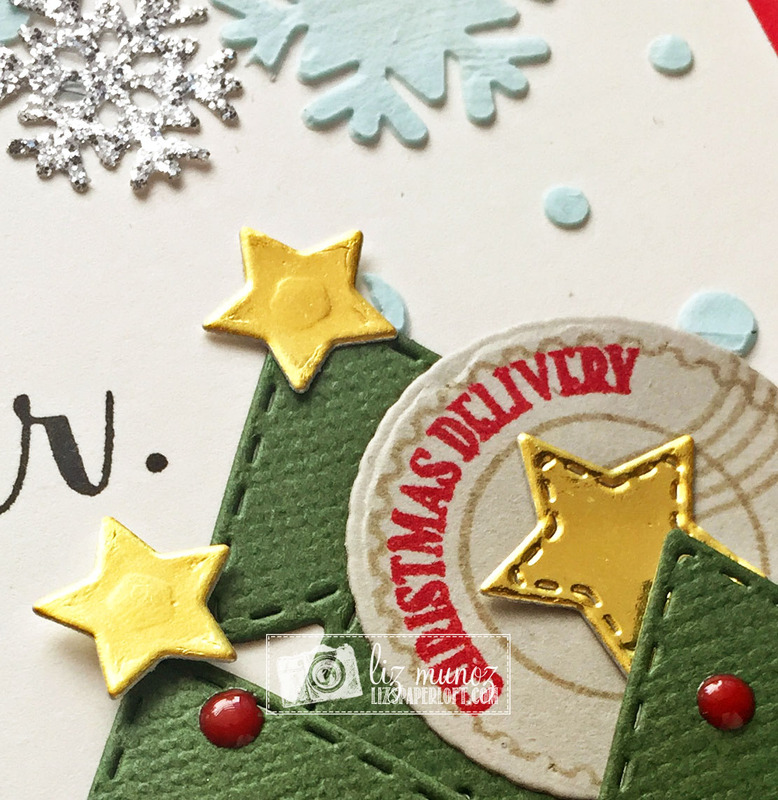 I love the saying you choose to stamp on your card, and the way you did your snow flakes. Cute scene with the snowflake background and the trees and presents. What a fabulous card. Love the pretty trees. Thanks for sharing your great idea. This card is so lovely! I want this kit!